Spain will move to suspend Catalonia's autonomy unless the region's leader drops his push for independence, the deputy prime minister says. Catalonia's government has insisted it will not meet Madrid's demands in the wake of a disputed vote on secession. Jordi Sánchez and Jordi Cuixart are being held while they are investigated for sedition - a move which many on the pro-independence side see as politically motivated. The men were leading figures in the 1 October independence vote, which Madrid branded illegal. "All I ask of Mr Puigdemont is that he acts sensibly... to put the interest of all citizens first," Mr Rajoy told the Spanish parliament on Wednesday. But if the separatist leader does not provide a satisfactory response by 10:00 local time (08:00 GMT) on Thursday, he "will provoke the application of Article 155", Ms Saenz de Santamaria said. Spanish Prime Minister Mariano Rajoy is cautious by nature but the fact he and his government are now openly discussing suspending Catalonia's autonomy reflects how much relations have deteriorated. 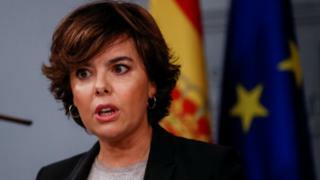 Deputy Prime Minister Soraya Sáenz de Santamaría's insistence that the Catalan government "return to legality" by Thursday morning's deadline appears to be firm but Carles Puigdemont is not expected to heed that appeal. He is under pressure from influential factions within the secessionist movement to push ahead with his independence "roadmap". There is also a feeling among many of Mr Rajoy's supporters and allies that he should act swiftly and his government is likely to confirm its implementation of Article 155 soon after Thursday's deadline. Article 155 of Spain's 1978 constitution allows Madrid to impose direct rule in a crisis but it has never been invoked in democratic Spain. It would be Spain's Senate, controlled by Mr Rajoy's conservative Popular Party (PP), that would launch the transfer of powers from Catalonia to Madrid. But the foreign affairs chief for Catalonia's regional government, Raul Romeva, told Reuters news agency: "Elections are not on the table now." 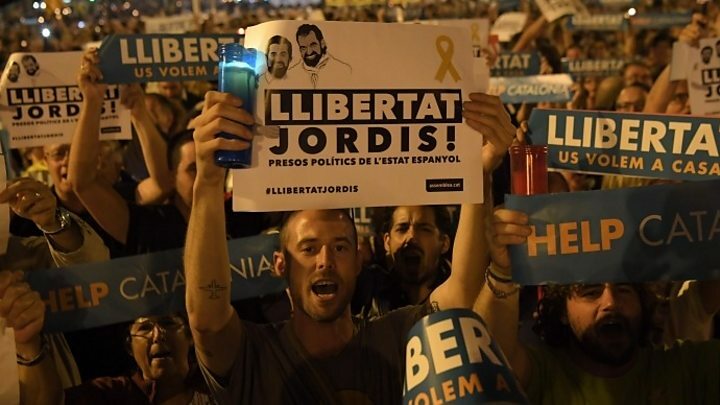 At one point, politicians from radical left-wing Spanish party Podemos held up placards urging the release of the Catalan independence activists, calling them "political prisoners".